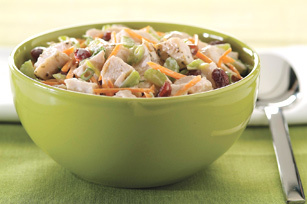 Start a new tradition with our Leftover Turkey Salad. Full of turkey, veggies and cranberries tossed in a creamy dressing, Leftover Turkey Salad is the perfect way to enjoy the day after a big turkey dinner. Try Leftover Turkey Salad the next time you host the holiday party. Combine dressing, vegetables and cranberries in large bowl. Add turkey; mix lightly. Cover. For added flavor and texture, add 1 Tbsp. GREY POUPON Dijon Mustard and 1/4 cup chopped water chestnuts to dressing mixture before refrigerating.